My father ‘smuggled’ me into the cinema wearing his overcoat. I often accompanied my dad to the movies. He must have got tired of the diet of quality – often foreign language – movies we viewed together for him to have chosen The Fiend as my introduction into grown-up films. Perhaps he reasoned that a western – albeit a violent one – would be safer territory for a father and son than a film that might have sexual content. The film starred television’s Wyatt Earp, the chisel-jawed actor Hugh O’Brian and as the ‘Fiend’ pretty-boy Robert Evans. It’s not surprising Evans soon gave up acting but as a producer he went on to become one of Hollywood’s most remarkable personalities. His Wikipedia entry is a must-read for anyone interested in cinema. When Evans wasn't busy getting married - seven times - he was producing some great movies. 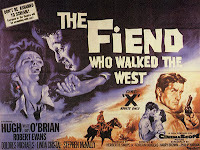 The Fiend itself made little lasting impression but I suppose it is a sort of landmark in my film-going history. *It continues to puzzle me that in the UK you can be old enough to marry at 16 but still be barred – officially at least – from viewing some films the censor considers too disturbing for another two years.